In my previous post I talked about beginning my first art class in decades at Denver Art Students League, and what it felt like to me, finding myself in a bare bones classroom again filled with people dedicated to the pursuit of creating abstract expressionist paintings. Let me just say that it was a thrill. To put it mildly. It was an indication, a life-marker in fact, that I was again going to take my art career seriously. Oh I have taken it seriously long before this, but there has recently been an interval of time when I was teaching art and not progressing much in the level of my own art. I did that for 3 years. Oh yes you do learn from teaching – you learn from your students and you stretch yourself as well because you are always searching for great new techniques to demonstrate. But as for me, I did not paint privately as much as I should have, for juried shows and galleries. I turned out a steady stream of art but none of it was critiqued and judged by anyone who was truly qualified, which is a mistake because an artist needs feedback and constructive criticism. I also mentioned, in the previous post, the project I was offered – and challenged with – on the first day of class by my instructor. It is the challenge of making a commitment to work on one particular painting for a solid year, not to the exclusion of all other paintings but in addition to them – in other words I begin to do a painting and give it my thoughts and intermittent attention for a year’s worth of my time. I walk up to it, I work on it for however long it feels right, I put it down for a while, giving both me and the painting a refreshing rest to catch our breath. Of course most every artist works on some paintings over a long period of time during which the he/she artist might purposely ignore the piece, leaving it still alive but in a dormant coma in the closet, and then one day the he/she artist decides to pull it out of the closet and look at it again to actually “see it again for the first time”. That practice is highly beneficial, and usually in an instant, the he/she artist has new ideas popping into mind and the painting is conscious again, gasping for oxygen as its life gets moving in a second-chance new direction. I love saving the lives of forgotten canvases. It is frugal and quite satisfying and it makes the art Buddha happy. The practice has proved effective time and again for me and many others. But not for a solid year…..and not while leaving it out in the studio where it takes up space for a 365 day period of time…. staring at you, screaming for attention, often driving you crazy I would assume. I am sure I will get sick & tired of looking at it sometimes. But I also assume that many learning opportunities will be associated with this challenge, which of course I immediately accepted. It has to be an exercise in patience, perseverance, dedication, determination, love/hate relationships, keeping an open mind, not being discouraged, striving consistently for excellence and not settling for the easiest and most obvious solutions, to name just a few of the ways to learn and mature as an artist from the experience. Sounds a lot like life, don’t you think? Wow. Art imitates life all the damn time, in case you had not noticed. I will be blogging about this, from time to time, with pictures of the work in progress. I have already had a small but significant wake-up call observation. This painting must be large. 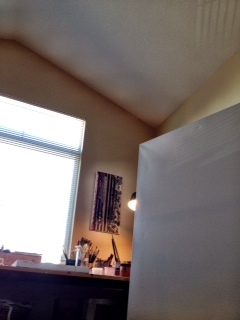 I could not work on a 24×36 for a long and winding, roller-coaster year….I need SPACE for a whole year. But guess what – I can’t fit a huge painting in my car, and I will have to be taking the canvas into my classroom from time to time for critiques. I have worked on very large canvases before but I had a different car then. One option would be to do a diptych, each piece as large as my car could accommodate. Maybe that will work. I’ll figure it out I am sure. So how large is your life canvas? Does it fit in your vehicle or are you living large?